The second edition of this successful textbook offers support for learners and continues to provide a significant reference text suitable for all Dental Care Professionals. Offering a clear, easy-to-follow, comprehensive account of all aspects of dental radiography essential to this group of professionals, this book is an important resource that renders it essential reading, particularly for those undertaking examinations in Dental Radiography. 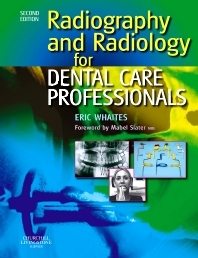 Eric Whaites heads up the Unit of Dental and Maxillofacial Radiological Imaging at King’s College London Dental Institute based at Guy’s Hospital in London as a Senior Lecturer and Honorary Consultant. He qualified from Guy's Hospital Dental School in 1978. Following a couple of years in general dental practice, he returned to Guy’s in 1981 and the following year obtained his Fellowship in Dental Surgery (FDS) from the Royal College of Surgeons of Edinburgh, in 1984 he obtained his MSc in Dental Radiology from the University of London and in 1990 obtained his Diploma in Dental Radiology (DDR) from the Royal College of Radiologists. Eric was awarded his Fellowship (FRCR) without examination by the Royal College of Radiologists in 2002 and the following year was awarded FDS ad eundem by the Royal College of Surgeons of England. Eric is registered on the General Dental Council’s specialist list for Dental and Maxillofacial Radiology. He is a former President of the British Society of Dental and Maxillofacial Radiology (BSDMFR), former President of the European Academy of Dental and Maxillofacial Radiology (EADMFR), former member of the DDR Examining Board of the Royal College of Radiologists and former Regional Adviser on Dental and Maxillofacial Radiology to the Royal College of Surgeons of England. Eric is a well known national and international lecturer on all aspects of dental and maxillofacial radiology.